Note: This post originally appeared in The Toronto Star. Story by Laurie Monsebraaten. Public Health Agency of Canada to pay investors up to $4 million only if Heart and Stroke Foundation program succeeds. Retired Toronto aeronautical engineer Ian Burns has struggled with his weight and high blood pressure for as long as he can remember. Daily medication has helped him lower his blood pressure to the high-normal range, but he says he’d love to control it without drugs. “Exercise has never been a major part of my lifestyle. My wife does her best, but there’s only so much nagging you can take,” adds Burns, 66, with a laugh. Experts in the field of high blood pressure, or hypertension, think they may have the answer for Burns and for the one in five Canadians on the cusp of developing the disease which is the leading cause of stroke and a key risk factor for heart disease. And they are willing to test their theory in a radical new way — with cash. In the first health-related social impact bond, or “pay-for-success” model in Canada — and the largest of its kind in the world — investors will fund the upfront costs of a new hypertension prevention program and the Public Health Agency of Canada will pay if it works. As part of this new approach to solving social problems, the Heart and Stroke Foundation of Canada will run the program and the MaRS Centre for Impact Investing has found 11 investors, including businesses, charitable foundations and wealthy individuals, to put up the money. Under the agreement, to be announced by Health Minister Jane Philpott Friday, the Community Hypertension Prevention Initiative will recruit 7,000 seniors on the verge of developing the disease in Toronto and Vancouver and help them make lifestyle changes aimed at keeping their blood pressure in check without drugs. Ottawa will pay up to $4 million to investors if the $3.4 million gambit succeeds. “We are committed to working with a range of partners to help Canadians lead healthier lives and reduce pressure on our health-care system,” Philpott said in an email. “This is the first time social impact bonds have been used by the government of Canada in the public health space, and we look forward to assessing their effectiveness and how they might be used elsewhere in the future,” she added. Left untreated, half of Canadians over 60 with blood pressure in the high-normal range will develop hypertension within four years. If the three-year prevention initiative succeeds in stopping that trajectory, Ottawa will pay the MaRS investors a return of 6.7 per cent. If the program over-shoots this target and blood pressure among participants goes down, investors will receive an 8.8 per cent profit for a total of $600,000. If the program fails to meet its goals, investors lose most of their money. Critics have questioned the concept saying governments, which can raise money more cheaply than the private sector, should not be paying a “middle man” to deliver public health and social services. But architects of the hypertension prevention scheme say the pay-for-success nature of the program makes everyone work harder to achieve results. “We believe that ‘pay-for-success’ premium is warranted because the government gets to explain to taxpayers exactly what their money has been able to do or accomplish,” says Adam Jagelewski, director of the MaRS Centre for Impact Investing. Hypertension is one of the country’s most serious health-care issues, affecting more than 6 million Canadians and is the most common reason for a person to see a doctor and to be prescribed a drug. Smoking, poor diet and lack of exercise are the main lifestyle culprits. “The costs are staggering, at about $14 billion this year, with the bill expected to rise to $20 billion by 2020,” says Dr. Norman Campbell, chair of hypertension prevention and control for the Canadian Institutes for Health Research and a key adviser on the project. The Heart and Stroke Foundation, which has been funding research and educating the public on heart health for more than 60 years, is eager to try the new approach. If successful, the model could be expanded or provincial governments across the country could fund the program directly with the knowledge their money would be making a difference, he adds. Heart and Stroke volunteers will begin recruiting participants at select Shoppers Drug Mart stores in Toronto next June for the six-month program. After that time, researchers believe lifestyle changes will become habits and participants should be able to control their blood pressure on their own. During the intake process, volunteers will record blood pressure readings, raise awareness about risk factors such as smoking, excess weight and sedentary lifestyles, and register participants for online resources. Through the website, participants will have access to information, tools and incentives to set goals and chart their progress. They will be directed to free local community programs such as walking clubs and cooking programs and followed up by trained coaches who will provide support. Volunteers will take a second blood pressure reading after six months. The two readings will be used to measure success. 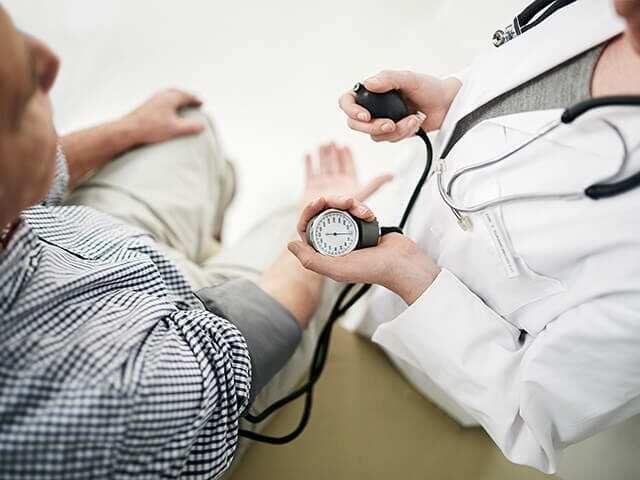 Although the initiative is targeting 7,000 adults over age 60 with high-normal blood pressure for the healthy behaviour support, it expects to screen up to 29,000 people who will receive hypertension prevention information. Since he is already taking medication to control his high blood pressure, Burns won’t qualify for the individualized coaching. But under the initiative, he and others who are intrigued by this new approach will have access to the same online information, community programs and self-monitoring apps. 22.2%: Percentage of adults with hypertension. 20%: Percentage of adults on the verge of developing hypertension. 20 million: Number of visits to physicians annually due to hypertension. 80 million: Number of anti-hypertensive drugs prescribed in 2010. $3 billion: Cost of anti-hypertensive drugs prescribed in 2010. $14 billion: Overall cost of treating hypertension in 2016. $20 billion: Estimated annual cost of treating hypertension by 2020. 32%: Attributable risk from a diet high in salt. 17%: Risk from diet low in vegetables. 17%: Risk from lack of exercise. 3%: Risk from high alcohol intake. Catherine Donnelly Foundation, Max Bell Foundation, Mindset Social Innovation Foundation, QBE Insurance Group, RBC Generator fund, Telus Ventures, The J.W. McConnell Family Foundation and several individuals.